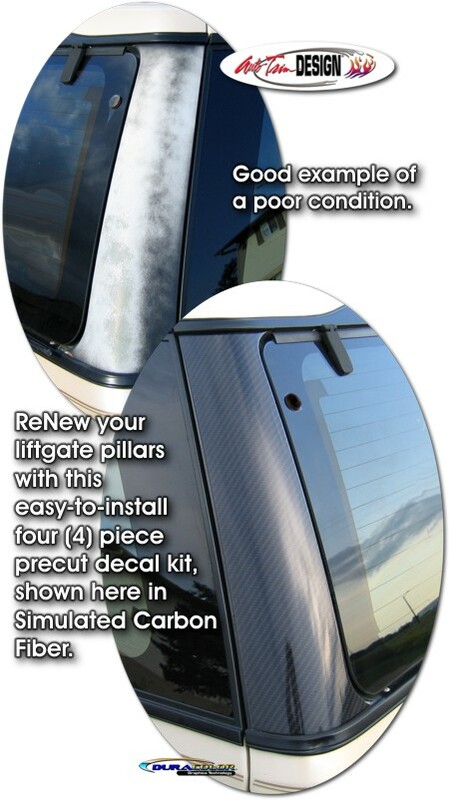 Detail, ReNew and Protect your '91-'10 Ford Explorer or Mercury Mountaineer's Flat Black liftgate pillars with our Liftgate Pillar Enhancement Decal kit. Factory liftgate pillar surfaces such as the Explorer's have tendency to discolor and fade. Manufactured with our DuraCOLOR Graphics Technology, this great-looking decal set - available in Gloss Black or Simulated Carbon Fiber - will enhance the overall look of your ride, at the same time keeping the liftgate pillars looking great! As a further step, decals are covered with a 2.5 mil clear laminate which provides protection from miles of abuse. Packaged as a set of two (2) pieces, decals are vehicle specific and fit any '91-'10 Ford Explorer, Ford Explorer Sport or Mercury Mountaineer and will not fit any other vehicle.